Explanation of Terms & Car Rental Information. Renters, including additional drivers, must present a full, clean driving licence. If the licence is non Western characters eg Chinese, Arabic, you will need, in addition, an International driving licence. A copy of licence is not acceptable (must be original). In addition a return airline ticket and rental voucher should be presented. Drivers must be at least 21 years of age in all states except for New York and Michigan, where the minimum rental age is 18. If driving licence is not written in English, client will need an International Driving Permit together with their national driving licence. Change of Drive r locally - should for any reason renter need to change the driver name at the counter, for reasons such as forgotten licence or credit card, they must both be present and the new renter must meet licence requirements. Non U.S and Canadian residents must present a valid credit card in the name of the renter, which is the preferred method for deposit. o Customers renting in Florida will have a minimum of $250.00 USD credit authorized on their card (excludes VISA, as above) o Customers renting in Hawaii will NOT have a credit card incidental amount. This excludes rentals paying with a VISA credit card. o Customer renting in all other states will have a minimum of $350.00 USD credit authorized on their card. Excludes rentals paying with a VISA credit card. o Debit cards will not be accepted at time of rental in New York, Hartford CT, Philadelphia PA, Boston MA and Detroit MI, and select locations in Baltimore, MD and Providence, RI. o Debit cards will not be accepted at time of rental for renters under 25 years in off airport locations. o Debit cards may be used at time of return to pay for the rental charges. At time of rental, an authorization hold will be secured on the credit/debit card provided, as detailed above. These funds will not be available for your use. All rentals are subject to meeting licence requirements. Cash deposits are no longer accepted at many locations. Optional Items such as - child seats, satellite navigation, additional drivers, one-way drop-off charges are payable upon arrival and are subject to local taxes and fees (see further sections for applicable charges). Client may purchase a tank of fuel at the time of rental at a local competitive price, which eliminates the need for client to refill before returning. ? For packages with Fuel included renters should return vehicle empty. There is no credit for unused fuel. Vehicles are provided with a full tank of fuel, there is no refund for unused fuel. If client has not accepted the FPO they can return the vehicle with a full tank and must show a gas receipt within 10 miles of the return location. If you choose to skip the pump we’ll refuel for you. A charge will be made at market price of fuel used plus a plat $5.00 USD service fee plus taxes and fees. To use this option just return with less fuel than when you started. Packages including the Fuel are a minimum 4 day rental only and is not available in ALL Manhattan locations. Added at the time of collection at a charge of $13.00 USD for all States except NY which is $3.00 USD and Nevada $12.22 USD, these charges are per day per driver plus taxes and fees. No charge for additional drivers for rentals originating in California. Drivers that are at least twenty-one (21) years of age, but less than twenty-five (25) years of age will be subject to a supplemental charge between $15.00 - $35.00 USD per day plus tax in all States except New York which is $35.00 - $41.40 USD and Michigan $25.00 – $28.00 USD, unless prohibited by state law. Prices vary by car class and rental location. In New York, drivers that are at least eighteen (18) years of age but less than twenty-one (21) years of age are subject to a supplemental charge of $72.99 USD per day plus tax and Michigan, drivers that are at least eighteen (18) years of age but less than twenty-one (21) years of age are subject to a charge of $48.00 USD per day plus tax. There are age restrictions on select specialty vehicles where driver must be 25 years to rent, this is relevant by location. Please check with reservations on the Premium, Luxury, Convertible, Minivans and SUVs. The daily charge is $13.99 USD per day, maximum of $91.00 USD per rental plus taxes and fees. Infant seats – Cosco Light & Comfy (Model #IC206CHZ) - Rear facing: Birth and Infants 5 – 22 pounds (2.3 – 10 kg) and 19 – 29 inches (48 – 74 cm) in height. Booster seats – Cosco Pronto (Model #22-491FSM) – Forward facing: for children 40 – 100 pounds (18.2 – 45.5 kg) and 34 – 57 inches (86 – 145 cm) in height. Dollar and Thrifty (all brands) require customers to install the child seats themselves. In all North America markets, the ISOFIX system is known as LATCH (Lower Anchors and Tethers for Children). LATCH has been required in all passenger vehicles since 2002 and Dollar and Thrifty (all brands) approved child seats are LATCH equipped. Customers are also permitted to use their own car seats. Many locations offer GPS units for an additional daily charge between $13.99 - $16.99 USD per day / $195.86 - $237.86 USD (14 day maximum, per month and then resets) plus taxes and fees. The small, dashboard-mounted device is programmed for multiple languages. They contain mapping details of the entire USA with nearly six million points of interest including hotels, restaurants, gas stations, ATMs and tourist attractions, plus the GPS unit can also be programmed to avoid toll roads. Dollar Thrifty units are mobile and are separate equipment from vehicle, as they are independent of the car they can be used in any vehicle. Customers may also purchase GPS inclusive rates. The Travel Tablet is a multi-functional mobile device that provides the customer with an array of features including advanced voice activated navigation, a portable Wi-Fi hotspot, international and domestic calling and text messaging, unlimited access to data, plus many other entertainment conveniences and can be programmed for different languages. This device would be an additional upgrade from the Garmin SAT NAV/GPS already offered. Many locations are now offering this new technology solution for use during the rental at an additional daily charge from $19.99 - $21.99 USD per day plus taxes and fees (not available in all locations). DTG offers the PlatePass electronic toll payment system, which is operated by PlatePass LLC, a division of American Traffic Solutions, to provide customers the convenience of utilizing electronic toll lanes without incurring any toll road fines or penalties. 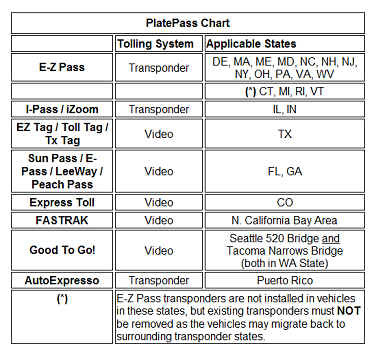 To utilize PlatePass on these toll roads, customers are required to purchase the PlatePass product for the entire duration of the rental. The daily charge is inclusive of all tolls incurred and ranges from $8.99 - $21.49 USD per day with some weekly rates available in certain markets. Customers who decline PlatePass but still use cashless toll roads, will be charged: (a) all tolls incurred; (b) a $15.00 USD administrative fee for each toll incurred (subject to a $90.00 USD cap for such toll-related administrative fees for the rental period); and (c) all other applicable toll charges or fees. In most cases, vehicles can be driven in any state in the continental United States. Vehicles are not permitted to be taken on ferries or to island locations without prior authorization. Travel is also not permitted via rail. See section below regarding Company’s one-way rental policy. Travel to Mexico is permitted with prior authorization and from any locations in California, Arizona, New Mexico and Texas. An additional Mexican insurance must be purchased locally to do so. The cost of Mexican insurance is between $38.00 - $48.00 USD per calendar day plus taxes and fees, which will assist with breakdown issues. PERS is not available in Mexico. Vehicles may be driven into Canada from the following Tour Participating locations: JFK, EWR, LGA and Manhattan locations, ORD, MDW, DTW, PHL, IAD, DCA, LAX, SFO, SEA, PDX and BOS. SEA is limited to Southern British Columbia (including Whistler), Vancouver metro area and Victoria BC only. PDX limited to Vancouver and Victoria, BC only. Travel to Canada must be requested via reservations and when confirmed noted on voucher/reservation. o Hand Controls are devices, which attach to the gas and brake pedals of the vehicle, enabling a physically challenged person to drive the vehicle without using their legs. Select models of our vehicles can be adapted with left or right Hand Controls. These are provided free of charge. o The majority of vehicles can be adapted with Steering Balls/Spinner Knobs and these are provided free of charge. o Must be requested at the time of booking to include the clock position for the device, so that the mechanics at the location can fit in the correct position for the customer.
. o Upon arrival customers should contact the DMV (Department of Motor Vehicles) to request a USA Disabled Parking Permit. They will be advised as to the location of the nearest DMV office and they will be required to visit this office in person to apply for a Disabled Parking Permit. o They need to bring proof of ID plus their UK Disabled Parking Permit. The shuttle service is available 7 days a week from 8:30am - 4:30pm. Basic Emergency Roadside Service for Dollar and Thrifty is included with every rental. This covers mechanical defects or breakdowns that can occur, when they occur within the approved driving area at no additional charge. During the winter season (1 October through 31 March) we provide our fleet with all season tyres, ice scrapper or snow brush, de-icer washer fluid, radiator anti-freeze at winter level and emergency road service at no extra cost. Local regulations in certain conditions may override this from time to time. You must make a new reservation for the extension rental period. Customer will need to return to location to renew contract. A rental day consists of 24 consecutive hours, each day starting at the time of the rental. Extra charges will apply when the rental exceeds a 24 hour period by 29 minutes. The customer will be charged at local rates for the extra time. Customers/Tour Operators will be charged for the number of days booked, irrespective of the number of days the customer actually rents. If the client returns the car early, the customer/Tour Operator will still be charged at the number of days reserved. Exceptions, such as medical emergencies, death in family, etc., will be handled subsequently by Customer Relations. Rental periods cannot exceed 62 days. If a rental is in excess of 62 days, additional reservations are necessary to accommodate the total number of days. The number of days reserved for each reservation may be split up as necessary, as long as no one reservation exceeds 62 days. The rental agreement must be renewed at a participating location and therefore client must return to location to do so. For example, a 70-day rental may be booked on a reservation of 62 days and one of 8 days or may be booked on a reservation of 40 days and 30 days. Additional reservations/voucher are required for each rental period, which must be presented at the counter for renewal of the rental record prior to the 63rd day (or whatever day rental has been split to). If the vehicle is returned to a location other than the original renting location, drop off charges may apply. Late return or ‘rental deviation’ fee is incurred if a customer returns the vehicle before or after the scheduled drop-off time. The customer will be charged the local daily rate, plus a $16.00 USD daily fee (5 day maximum) if they are more than 12 hours late to return the vehicle. If customers are expecting a late return during their rental period they are encouraged to contact the number provided on their Rental Agreement if they have a change in their return date. A Return Change Fee of $10.00 USD will be applied. The agents will be able to adjust the Rental Agreement and inform the client of any rate changes and applicable fees, which will be at the local daily rate. Early return – there is no refund for unused days. Unlimited mileage applies to all vehicle rentals. There may be a local surcharge imposed by the state. Any such charges are payable at the time of collection, unless stated as being included in the net rates. Optional items such as child seats, one way rental fees, GPS plus items not included in the net rate (voucher) are subject to local taxes and fees. Products purchased at the rental counter are subject to all applicable federal, state and local taxes, fees, charges and surcharges. If any additional federal, state, local taxes, fees, charges or surcharges are imposed during the term of this contract, or, if there is a modification to these, such additions or modifications will be charged to the client at the counter. o CONCESSION RECOVERY FEE: Concession Recovery Fees are charged unless prohibited by law. These fees assist in covering all or part of the average concession fees plus the additional cost of doing business. Concession Recovery Fees can apply to but are not limited to Airports, Hotels, FBO’s and Train Station locations. They apply on the prepaid portion of the rental and on any and all products purchased at the rental counter. o ENERGY SURCHARGE: The cost of energy needed to support our business operations, to offset the cost of utilise, bus fuel, oil and grease, etc. $1.49 USD per rental where it is not prohibited by law.
. o Loss Damage Waiver (LDW) is not insurance. It is a waiver between the renter and the car rental company of all financial responsibility for loss or damage to the rented vehicle, including theft, provided the terms and conditions of the Rental Agreement are not violated. o Available from $9.99 USD per day plus taxes and fees, where not included in the rate. o When renting a vehicle, you are personally responsible for any and all loss or damage to the vehicle, regardless of fault. o Many times the cost of the Loss Damage Waiver may be less than what you would pay if you accept responsibility for the vehicle and use your own insurance or credit card coverage. o Loss Damage Waiver allows the renter to avoid these financial responsibilities and leave with the peace of mind that we will eliminate that responsibility. Liability Insurance Supplement (LIS) / previously SLI - Liability Insurance Supplement (LIS) covers third- party automobile liability claims for bodily injury and property damage. o LIS is primary coverage to your personal policy and covers your liability to third parties, resulting from an auto accident in the rented vehicle, for bodily injury and property damage (other than to the rental vehicle). o Maximum protection of $1,000,000 USD for each occurrence. o In CO, NY and Puerto Rico only LIS provides uninsured and underinsured motorist coverage for bodily injury up to $1,000,000 USD per accident. o Available between $13.99 - $17.95 USD per day plus taxes and fees, where not included in the rate. o Note: ALL rentals commencing January 1st, 2017 – LIS will provide $1,000,000 USD for third- party automobile liability claims for bodily injury or property damage claims for each occurrence. LIS will also provide uninsured and underinsured motorist coverage for bodily injury up to $1,000,000 USD per accident. New LIS product will be priced between $12.34 - $18.85 USD per day plus taxes and fees (varies by state), where not included in the rate. o If Premium Emergency Roadside Service is purchased it provides accidental towing, lock-out, flat tire, fuel, lost key and battery service, plus a 90 minute roadside service guarantee. Providing additional cover for travel emergencies other than vehicle breakdown. o It also covers travel interruption reimbursements up to $1,000 USD for certain expenses incurred when a vehicle has been involved in collision. o Cost is between $7.99 - $8.99 USD per day plus taxes and fees. o This towing and support service is country specific so would only include cover when travelling within the US or Canada. o In states where UMP is offered, LIS does not contain any Uninsured/Underinsured Motorist coverage. o In states where UMP is not available, UMP coverage up to $100,000.00 USD is included with the LIS coverage. o Available at $6.99 USD per day plus taxes and fees, where not included in the rate. o UMP will not be offered or available effective January 1st, 2017. Personal Accident Insurance (PAI) & Personal Effects Coverage (PEC) - This option provides Personal Accident Insurance for accidental death and accidental medical expenses as well as Personal Effects Coverage. o Added at the time of collection $6.99 USD per day (except NY which is $2.95 USD a day) plus taxes and fees. o Renter is covered 24 hours a day, in or out of the vehicle, during the rental term. 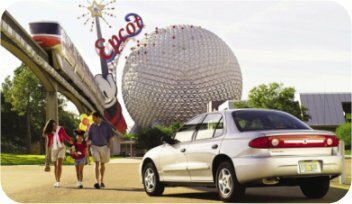 o Passengers are covered riding in, entering or exiting the rented vehicle. o We will not pay benefits for any Covered Loss or Injury that is caused by, or results from - Suicide or attempted suicide, Intentionally self-inflicted injury, War or any act of war, whether declared or not. Commission of, or attempt to commit, a felony, an assault or other illegal activity. Flight in, boarding, or alighting from an Aircraft. The insured being under the influence of drugs or intoxicants, unless taken under the advice of a Doctor. Repair, replacement, examinations for prescriptions, or the fitting of eyeglasses or contact lenses. Pregnancy, childbirth, or miscarriage. Injury sustained while participating in a prearranged or organized race or testing of a vehicle. o We will not pay for - Loss or damage due to theft unless reported to the police or competent authority. Any loss or damage directly or indirectly caused by declared or undeclared war or any act thereof. Loss or damage due to moth, vermin, wear and tear, gradual deterioration, mechanical or electrical failure or inherent vice. Property while in the care, custody, or control of any common carrier. o Both the PAI and PEC coverage pay in addition to any other policies that may cover the renter or covered parties. Emergency Sickness Protection (ESP) - is available to all non U.S. citizens who possess a valid non-U.S. passport at the time of rental. It provides certain medical benefits for some sicknesses for the renter and any person who is a member of the renter’s traveling party. Additional covered persons must also possess a valid non-U.S. passport and must have written proof that they are a member of the renter’s traveling party such as itineraries from a travel agent. o Added at the time of collection $5.00 USD per day plus taxes and fees. ESP may not be available in all locations. o Exclusions - we will not pay medical expenses benefits for any treatment or services for sickness that is caused by, or results from sickness where the insured’s trip to the host country is undertaken for treatment or advice for such sickness, except as provided in the Policy. This is only a brief summary of LIS, PAI/PEC and ESP coverages. The specific terms and conditions are subject to all the provisions, limitations and exclusions contained in the applicable insurance policies. Please Note: Information provided in this document correct at time of issue, includes overview of the Dollar Thrifty optional services. Cost and conditions of all options/taxes/fees/surcharges are subject to change without notice. Optional items are plus taxes and fees relevant to location/state.